Editors' Picks: The Best Vacation Attractions in Each State! In the immortal words of the Go Go's, vacation is all I ever wanted. While numbers have indicated less Americans are vacationing in recent years, those statistics are beginning to shift. With trends like flying getting cheaper (because of record-low prices for oil) and national parks celebrating their 100th anniversary, America may be getting bit by the travel bug again. While there are sublime getaways all over the planet, this beautiful nation is home to plenty of hot spots to spend your leisure time. In fact, each of the 50 states has something entertaining and special to offer its visitors. From the country's most frequently-visited spots like national monuments and parks to some lesser-known museums and navigable caves, we have it all right here. It doesn't matter where you are, AmericanTowns can help you travel freely. Here are the best vacation attractions in every state in the U.S. Sitting on the shore of the Gulf of Mexico, this stunning beach offers perfect white sand and picturesque ocean waves. And there are plenty of other surrounding attractions to visit. Adventure Island has go karting and laser tag, as well as a variety of other games and rides for families. If you want to be out on the water, try some deep sea fishing. At the end of the day, head on down to The Wharf which has hundreds of fun activities including cool places to shop, restaurants and a Ferris wheel. Alaska might not be the warm and sunny paradise you imagine when you think of vacation spots, but this state offers some of the most breathtaking sights on the planet. Kenai Fjords National Park features boat tours, hiking and kayaking. But it's important to remember that all of these activities can be quite strenuous. The Harding Icefield Trail is a stunningly beautiful, 8-mile round trip path that can take between 6-8 hours to hike. Kayaking in Kenai Fords is a popular activity but it is recommended to go with a guide if you are inexperienced. You can get up close and personal with massive glaciers and fascinating marine life over glassy waters. If you're equipped with the skills for this kind of adventure, it's something you really can't pass up. 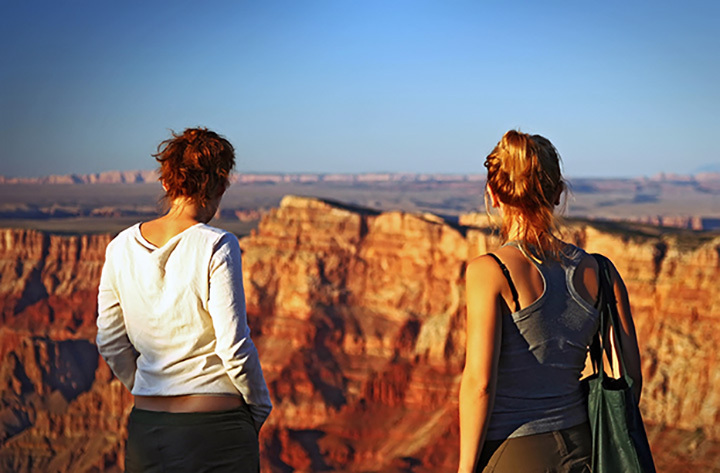 The Grand Canyon is one of the most important landmarks of this country. While it sounds like the most generic place you could visit in the United States with about five million people visiting every year, it is still a sight you must see in your lifetime. The canyon is 277 miles long, up to 18 miles wide and can have a depth of about 6,000 feet. For free, you can attend a ranger program where a park ranger teaches you about the nature and history of the Grand Canyon. Walking and hiking through parts of the canyon are a popular activity. There are also year-round mule trips offered on the South Rim. This water and theme park is the perfect attraction for families to get away for a day of rides and games. For the adrenaline junkies, there are thrill rides like the Sky Shark (a bungee jumping ride), the Gauntlet (a looping steel coaster), and Plummet Summit (a thrilling raft ride). The theme park also offers rides for families and kids, a huge water park and a concert series with concerts from the country's hottest artists like Hunter Hayes and Cheap Trick. Created in 1890 and located in the Sierra Nevada mountains of central eastern California, Yosemite National Park is one of the oldest nature preserves in the country. While Niagara Falls is truly a sight to behold, the Yosemite Falls is the tallest in North America with a 2,425-foot drop. This space is filled with natural wonders like massive, 3,000 year-old sequoias, vast meadows and serene lakes. With all of this, and an incredibly diverse animal life, you never really know what you're going to see when you visit this historic spot. Colorado is one of the most popular ski destinations in the country, and the Vail Ski Resort is one of the top-rated spots to stay for a ski vacation. With over 5,000 acres of skiing trails plus a Swiss-style village with lodging, shopping and restaurants, this is a winter wonderland getaway. Vail is known to offer some of the most well-groomed mountains in the country and is suitable for skiers of a variety of skill levels. If you're visiting during warmer weather, explore the mountains on foot or bike. The opportunities are endless. This seaside city is the perfect New England vacation spot. The famous Mystic Seaport and Mystic Aquarium are just two places you can spend your time while staying here. Mystic Seaport, a maritime museum, is home to the Charles W. Morgan which is the country's oldest commercial ship and last wooden whaleship on the planet. Mystic Aquarium, according to its website, has a mission "to inspire people to care for and protect our ocean planet through conservation, education, and research." While it's a lesser known spot to visit in this country, Mystic is frequently visited by huge celebrities as a peaceful getaway from their busy lives. Taylor Swift and Meryl Streep are just two stars who have been spotted there. The Dover International Speedway is one of the top-rated attractions in Delaware. If you've got a need for speed, this is the place for you. Visit the speedway for thrilling car racing action. Nicknamed "the Monster Mile," the track has been open since 1969 and has hosted two NASCAR events. For the more adventurous visitors, you can purchase tickets to ride inside of a real stock car and experience what it's like driving through the Monster Mile. While yes this spot is frequented by tourists (with over a million people stopping in every year), the Florida Keys are still some of the most beautiful places in the country. If you're an angler, this is an ideal spot for diving and sport fishing. Each island kind of has its own personality, where everyone can find something they like to do. From relaxing spas and nights at the theater to sailing and snorkeling to close encounters with marine life, the Keys have it all. The waters are a sparkling sky blue, the sands are sugary white, and the list of activities are infinite. These gardens, according to their website, have the mission of "connecting man and nature in a way that benefits us both." The space is man-made but located in a stunning natural environment. The Education Department offers educational opportunities to visitors with workshops and hikes, school and group programs as well as internships and volunteering opportunities. The grounds are comprised of immaculate, lush gardens for visitors to walk through. There are also other activities available such as golfing, tennis, fishing, and bicycling. On top of all this, there are great dining spots and places to stay available. It's the ultimate peaceful southern vacation. The entire state of Hawaii alone is one, big vacation destination but there are some places that are particularly special. And one of those places is Maui. There really is nothing more postcard picture perfect than the second largest island in Hawaii. You're going to want to photograph every single moment of it, but make sure to enjoy your time while you're there because it is a gem of this planet. The scenic island is a popular tourism spot with a small population. Enjoy a day on the water, go golfing, go whale watching, or just spend a day on the beach relaxing. The beaches are exquisite, the temperatures are perfect, and the ocean is more beautiful than you could even imagine. This mountain town's quaintness sort of makes you feel like you live there year-round. This is an ideal getaway for a family or a romantic destination for a couple. Swimming, paddle boarding, boating and other water sports are available on Payette Lake. After a day on the water, go huckleberry picking or hiking. McCall is known for its Winter Carnival, which was inspired by the Payette Lake Winter Games that first started in 1924. The carnival features snow sculpture contests, parades, delicious food, games and tons of other activities for the whole family to enjoy. This 3,300-foot long pier on the Chicago shoreline of Lake Michigan is a popular tourist attraction in Illinois. The spot is home to over fifty acres of gardens, shops, restaurants and other attractions. The pier has fireworks on Wednesday and Saturday nights in the summer and Saturday nights in the fall. By far though, its most famous evening of fireworks is on the Fourth of July when hundreds of thousands of people flock to watch this impressive pyrotechnic display. In the winter, lace up your skates for a day at the indoor ice rink or visit the Amazing Chicago's Funhouse Maze which has 4,000 square feet of tunnels and mazes. The Association of Zoos and Aquariums and the American Alliance of Museums named the Indianapolis Zoo the only institution as a zoo, aquarium and botanical garden in the U.S. Clearly, this place has a lot to offer. Opened in 1964, this zoo has collection of 3,800 animals and over 320 different species. The zoo features zebras, giraffes, elephants, tigers, you name it. At the aquarium, you can get up close and personal with dolphins. There are so many animals to see, it'll be hard to catch them all but this space offers the perfect family-friendly environment and plenty of opportunity to learn about the great animals of our planet. Good news baseball fans, you can visit the famous Field of Dreams for no cost at all! Dyersville, Iowa is the home of the Field of Dreams, the field in the award-winning 1989 film. Tour the very grounds that this iconic movie was filmed on. After that, visit farms and wineries in the area as well as baseball museums filled with historic memorabilia. And if you're planning to stay, no worries, there are affordable inns and hotels conveniently located nearby. And make sure to stop by the gift shop to pick up a Field of Dreams souvenir to always remember your visit. About 650 feet underground sits one of the largest deposits of rock salt in the world. This space was formed 275 million years ago when the Permian Sea dried up. The museum is located in the Hutchinson Salt Company mine. And there are a variety of attractions down there for the public, one of them being the Stratacenter which offers a unique space for parties and receptions. So next time you want to have a party, think about hosting one over 600 feet beneath the earth's surface! There is also a Safari Shuttle that takes you through mazes of the mines on a tour, there is the Mining Gallery which takes visitors inside the life of a miner, and a geology exhibit. This is a working horse farm and educational theme park that opened in 1978 in Lexington. The park is dedicated to "man's relationship with the horse." Two times a day, there is a Horses of the World Show which displays a fascinating variety of horses that you might not get to see anywhere else. There is also the International Museum of the Horse which has a historic collection of memorabilia. If you're a horse lover, it's important to see a place so deeply dedicated to educating the public about this beautiful animal. If you're looking for a good party, the French Quarter is kind of no-brainer vacation spot. The oldest neighborhood in New Orleans, the French Quarter is home to the Mardi Gras celebration. Bourbon Street is famous for its wide variety of drinking establishments including places like Pat O'Brien's Bar, Lafitte's Blacksmith Shop, and the Napoleon House. For a bit of history before an evening of partying, visit Jackson Square, a public park located right at the front of the French Quarter and named after Andrew Jackson. This 47,000-acre park is located on Maine's Mount Desert Island. This spot is home to Cadillac Mountain, which is the highest point on the United States' East Coast with an elevation of 1,528 feet. The terrain of this park is diverse, with mountainous and woodland spaces but also an ocean shoreline. For the true outdoor experience, camp out at the Blackwoods Campground, Seawall Campground, or Schoodic Woods Campground for an evening under the stars and a toasty campfire. This beautiful resort town is a popular tourist destination in the summers. The location features long stretches of beach, bustling boardwalks, fine dining and theme park attractions. Everything you want in a summer vacation spot. And you can do all of this on a budget! The official Ocean City website actually has a section where they list 100 free things to do in the city which include activities like free fireworks shows, movies on the beach, museum visits, and an assortment of outdoor fun. Boston is a historic city and the Freedom Trail might be one of the most storied and educational of them all. This 2.5-mile-long route leads visitors through 16 historically significant sites. From museums and meetinghouses to churches and burial grounds, this trail is rich in old New England history. The educational trail offers walking tours that teach the public about the American Revolution and important historical events. With Freedom Trail Players, actors dressed in period garb, it makes the educational aspect of the tour colorful and exciting for young kids. This national park located on Isle Royale and other islands in Lake Superior was established in 1940. There is fascinating evidence of much older history, though. Copper was mined on Isle Royale by indigenous people many years ago. The region still features mine pits that can be up to 20 feet deep. Analyzing wood remains in the area indicate that some of the artifacts are at least 5700 years old. But today, it's a vast and beautiful space for the public to explore. The Greenstone Ridge Trail runs 40 miles and is usually a 4 to 5-day hike. In total, there is about 165 miles' worth of hiking trails available for visitors to trek through. For an overnight stay, there are also 36 designated wilderness campgrounds. One of the most fascinating spectacles in this country, Minnesota's Mall of America is the largest mall in the United States. The mall welcomes over 40 million visitors annually with most of the visitors coming from within the state and surrounding states. This place is massive with over 520 stores offering just about anything your heart desires. The mall covers 96.4 acres of space. To put that in perspective, about seven Yankee Stadiums would fit inside of this mall. Not only are there shopping venues, but there is a theme park inside. Nickelodeon Universe features rollercoasters and a plethora of other rides. It is virtually impossible to get bored here. The South offers a lot of opportunities for exciting entertainment but the city of Bixoli is something special. If gambling is your thing, you can visit one of the nine different casinos in the area. There is also a lot of opportunity to explore arts and culture with the Ohr-O'Keefe Museum of Art. This museum is a nonprofit dedicated to the ceramics of artist George E. Ohr. The skyline is an absolute stunner on a perfect evening and you can catch that on the water or sitting on one of the many gorgeous, smooth sand beaches in the city. Branson is a dynamic, family-friendly city located in southwest Missouri. There are tons of places for entertainment on the strip such as Silver Dollar City, an 1880s-style theme park. You can visit the go-kart track at the Track Family Fun Parks, zip-lining over incredible sights on the Vigilante Zip Line at Shepherd of the Hills, or even play some golf at Grand Country Indoor Mini Golf. At night, make sure you catch a live music performance from one of the many shows available on a nightly basis. From theater to live country classics, there is something for the whole family to enjoy in Branson. There are plenty of top-notch ski spots in states like Colorado, but Montana offers some of the best spots in the country. Big Sky is home to the Biggest Skiing in America with the Big Sky Resort boasting 5,800 acres of skiable terrain. According to their website, Lone Peak's summit is 11,166 feet which is as tall as nearly nine Empire State Buildings. The snow is always perfectly fluffy and with so much space, you'll never get bored. If skiing isn't your thing, you can also go for sleigh rides, dog sledding, ice skating and zip lining. Unwind after a long exhausting day by relaxing in the spa. It's a nice escape from the rest of the world. USA Today's 2016 Readers' Choice ranked Henry Doorly Zoo the sixth best in the country. In 2014, TripAdvisor deemed this zoo the world's best as it received such high reviews from its visitors. Henry Doorly has over 130 acres of space, an aquarium and an IMAX theater. Get a unique perspective of the zoo on the Skyfari which is a chairlift ride from the Berniece Grewcock Butterfly and Insect Pavilion to Pachyderm Hill. And if you're planning an event, you can rent out a space at the zoo for birthday parties, weddings, and picnics. This 4.2-mile stretch of Las Vegas Boulevard South located just south of the Vegas city limits is home to fifteen of the world's 25 largest hotels by room count. There are over 62,000 rooms available on the Strip, a place defined by casinos, resorts, theme parks, and places to shop. Visitors might be overwhelmed by the flashing lights and buzzing of this hot tourist spot. Stay in the Bellagio, a gigantic and glamorous casino resort fronted by an 8-acre, man-made lake with dazzling fountains. Or maybe spend the night at Caesars Palace, a Roman-themed casino hotel with hot tubs, wet bars and 90-inch flat-screen televisions. It's important to remember that this isn't exactly a family-friendly vacation, either. Hit up the Strip with your significant other, or with a group of friends who are at least 21 years-old. This 80-passenger cable car takes visitors to the summit of Cannon Mountain, 4,080 feet up offering fantastic views. According to its website, you can see the mountains of New Hampshire, Maine, Vermont, New York and Canada on clear days. The views are stunning and seemingly endless. At the summit of the mountain, there are walking paths, a cafe and a bar. This is also New Hampshire's highest, lift-accessed point. First opened in June 1870, the Atlantic City Boardwalk is the very first in the United States and still is one of the most popular in the world. A few famous attractions on the boardwalk are the House of Blues and the Ripley's Believe it or Not! museum. The boardwalk also features a variety of stores and delicious restaurants. Visit the iconic Steel Pier, which is 1,000 feet of amusement park rides, games, and snacks. There are roller coasters, carousels, and slingshot rides as well as fun carnival-style games to win that giant stuffed bear you always wanted. Tucked deep beneath the Chihuahuan Desert are more than 119 caves that were formed when sulfuric acid dissolved the limestone. Now the public can explore all of these caverns and admire the structures. After the purchase of an entry ticket, you can take a tour through two of the self-guided cavern routes to observe at your own pace. If not, you can check the schedule to participate in a ranger-guided tour. Every summer on one evening, the public is invited to the special Dawn of the Bats event. On this day in the early hours of the morning you can watch as cave bats dive back into their cave after an evening of searching for food. Their stunning acrobatics are a breathtaking sight. You might've seen this iconic American landmark featured in films and photos, but only until you see the Statue of Liberty in person can you really appreciate its magnificence. The 300-foot figure is one of the most recognizable structures in this country, a symbol of freedom. To see her, you can get ground tickets, pedestal tickets and crown tickets. The crown tickets are limited but take you all the way to the top of the statue, offering superb views of the surrounding area. The fourth warship in the U.S. Navy named in honor of the State of North Carolina, this vessel is accessible to the public for tours. The ship was commissioned in April 1941 and at the time was considered the world's greatest sea weapon, according to its website. The vessel is armed to the brim with high-powered weaponry and during wartime was inhabited by 144 commissioned officers and 2,195 enlisted men. The massive ship is now a memorial that offers self-guided tours for visitors to observe the many aspects of the historic structure. Because there is so much to see, the website recommends at least spending two hours inside this vessel. The 6,000 square foot facility at the Frontier Village in Jamestown, North Dakota presents the history of bison to the public. With incredible artifacts and works of art as well as remains of prehistoric bison, you can learn everything you've ever wanted to know about this animal. The museum actually has a 25-30 head buffalo herd which includes a rare albino buffalo called White Cloud. Being able to see these remarkable animals live and in person is one of the most exciting parts of the visit. Observe these massive beasts up close and unlike you ever have before. Established in 1983, the Rock and Roll Hall of Fame was created to commemorate the most influential artists, bands, producers and other musical figures. Being inducted into the Rock and Roll Hall of Fame is an enormous honor only bestowed upon the most significant artists of all time. The Cleveland museum has hosted over 10 million visitors since its opening in 1995. The collections at the museum feature historic pieces of music history such as Elvis Presley's custom motorcycle, several of John Lennon's pianos, one of Jimi Hendrix's famous guitars, and Stevie Wonder's harmonica. This art museum has two locations. The main location is in part of a former 1920s villa. The space highlights nine collections of art from all over the world, though there is a focus on Native American art which features pottery, painting and jewelry. The garden view of the villa is a stunning sight in itself, with sprawling plants and flowers all framed by a rustic-looking pool below it. You can spend hours inside of this place absorbing endless amounts of arts and culture. This beach is recognized by its well-known landmark, Haystack Rock, which is a marine sanctuary protected by the Oregon Islands National Wildlife refuge. The rock stands tall at 235 feet and has small caves that run through it. The beach itself is simply marvelous with flat, soft sand and the sound of the ocean waves making a perfect, relaxing soundtrack. The surrounding area also features a variety of places to eat, drink and shop. This family theme park has won several awards for its high quality entertainment. The park has some of the coolest thrill rides in the country, including the classic wooden roller coaster Comet, the 61-mph Great Bear and the sooperdooperLooper which does exactly what it sounds like it does. If thrill rides aren't your thing, there are plenty of more laid back and family-friendly rides like the tea cups, swing rides, and bumper cars. Hersheypark also has water fun with water parks, giant water slides and other attractions. You don't visit Newport without doing the Cliff Walk. The walk runs from the east end of Bailey's Beach to the western end of First Beach, featuring picturesque views of the water and enormous mansions lining the shore. Some of the famous mansions include Astor's Beechwood, Rosecliff, Marble House, The Breakers, and Ochre Court. Feel the ocean breeze and gaze out to the sea for the perfect, relaxing and scenic walk through this idyllic Rhode Island town. Over 14 million visitors travel to see Myrtle Beach every year, and for a very good reason. This coastal city is kind of like one giant theme park with all of the attractions it has to offer. Visit Broadway at the Beach for some zip lining, mirror mazes and mini golf. If you're into racing, go to the Myrtle Beach Speedway for some thrilling racing action. Grab a bite to eat at one of the many dining spots in the area like the upscale Villa Romana or the more family-oriented Jimmy Buffet's Margaritaville. Visit the second largest city in South Dakota to see the Reptile Gardens, Bear Country USA and Storybook Island. Reptile Gardens was named the world's largest reptile zoo by the Guinness Book of World Records in 2014. Bear Country USA is a seasonal, drive-through wildlife park that holds wolves, bear and elk. And the highly kid-friendly Storybook Island is a cute park with attractions inspired by famous characters and places from children's books. For a little bit of history, travel under forty minutes outside of the city to Keystone to see Mount Rushmore. The estate of the King, Elvis Presley, was opened up the public in June 1982. Visitors can walk through the mansion where Elvis lived for over 20 years and is now laid to rest in the garden. When you walk in, you're welcomed by Elvis' living room that will give you such a late 60s and early 70s nostalgia. The Trophy Building is home to a massive collection of Elvis' gold and platinum records and other memorabilia. The Racquetball Building features some of his iconic jumpsuits and a racquetball court that Elvis loved. In the Meditation Garden, you can visit the King's grave to pay your respects. This space center attraction houses famous space artifacts and hardware like Mercury 9, Apollo 17 and Skylab. Visitors can watch movies like To Be An Astronaut and Inside the Space Station at the Northrop Grumman Theater. There are also a variety of tours that take visitors through displays of massive spaceships and other hardware. The center hosts almost 1 million visitors every year and has seen 18 million since its opening. There is a strong emphasis on educating the public about these incredible space crafts, but in a fun and easily digestible way. You have most definitely seen these famous, picturesque arches in hundreds of photos. But experiencing them in person is an entirely different event. This park contains over 2,000 natural sandstone arches that are so beautiful they look like pieces of man-made artwork. The most famous of those arches is the Delicate Arch, which is a completely natural structure that stands at 65 feet tall. Backpacking, hiking, camping and horseback riding are just a few activities available to the public in this national park. Have you ever wondered where your favorite ice cream was made? Well, you can see it! Seven days a week, Ben & Jerry's offers tours of their facility with manufacturing in operation. The 30-minute factory tour takes guests through the process of creating this delicious sweet treat. And of course, you get to try some of the ice cream too. Virginia Beach, an independent city listed in the Guinness Book of Records as having the longest pleasure beach in the world, is one of the hottest tourist destinations in the country. Some cool spots include the Oceanfront which is a three-mile-long boardwalk space by the beautiful beach. One of the staples of the area is the enormous, 34-foot-high bronze statue of King Neptune that greets visitors. Get out of the sun for a while and visit the Virginia Aquarium which holds over 700 different species. The Seattle Center was built originally for the famous 1962 World's Fair but now serves as a space for arts and entertainment. The area is characterized by the 605-foot space needle which is the tallest building west of the Mississippi River. The International Fountain in the middle of the campus is a spectacular sculpture with water shooting out from a half-dome shape in a variety of patterns. There are also plenty of places to dine and shop. What was once used as a ceremonial space for Seneca Indians is now a popular tourist spot in West Virginia. The well-lit, winding caves have been open for tours since 1928. The guides lead visitors through these captivating caves which at points, dips down 165 feet below the entrance. The largest cave space, Teter Hall, is 60 feet tall and 60 feet wide in some areas. I bet you didn't know there was a Hall of Fame for fresh water fishing. If you are big into fishing, maybe you did. It's hard to miss the 143-foot-long fiberglass muskie sculpture right when you walk onto the grounds of the museum, which hosts around 100,000 visitors a year. The lower jaw of the giant muskie fish actually serves as an observation deck for the public to look out over the area. The museum is located on a six-acre plot of land and has multiple structures all over the premises. The museum also contains over 400 mounted fish and 300 outboard motors. People inducted into the Hall of Fame fall under one of four categories: Enshrinement Programs, Fishing Guide Recognition, Legendary Anglers Organization Recognition. The very first national park on the planet, Yellowstone is the home to an abundance of wildlife. The space stretches across 3,472 square miles and is mainly covered by forests. The park includes an active volcano, 290 waterfalls, and more than 500 active geysers which is more than half of the world's geysers. There are 67 different species of mammals on the grounds, 285 species of birds, and 16 species of fish. This place is truly a wonder of nature. Yellowstone sees over 3 million visitors ever year. While you're there, you can go backcountry camping, boating, biking, cross country skiing, fishing, or take a guided tour of some areas. You could spend weeks in this exquisite place and never grow tired of it.